A simple phone system solution for every business size, type, and location. No PBX or VoIP equipment, landlines, phone rentals, or new wiring. Use the Andriod or iPhone smartphone you already have on WI-Fi or cellular LTE/4G. And, if there’s ever a need to add physical desk phones later, just call us. 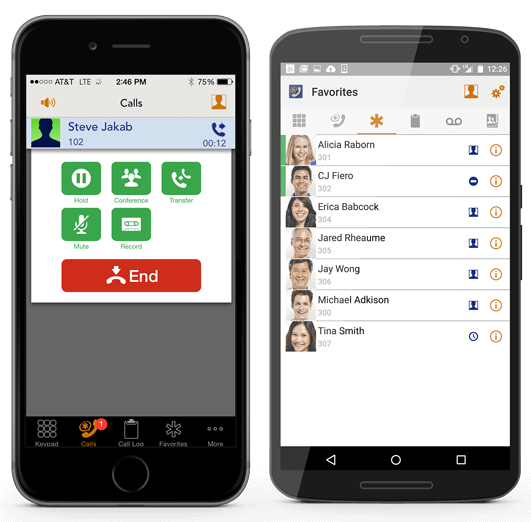 Switchvox Softphone is a powerful small business phone system on an app for today’s remote and mobile workforce with an iPhone, iPad, or Android. Stay connected to the “office” no matter where you are in the world. No nickle-and-dime nonsense. Switchvox small business smartphone phone system on an app is able to provide a unified communications system for one location or many locations — for the best value anywhere. Create an automated, customizable greeting that lets callers choose the person or department they are trying to reach with a simple selection. Make, receive, and transfer calls from your smartphone so important calls always reach the right person and always show your business caller ID (instead of your iPhone’s). Move your existing phone number over to your new Switchvox phone service or choose a new phone number from any U.S. area code or get your own toll-free number. Click to call any number, see who’s on a call, update your call rule status, or set up a conference call — all with the included Switchboard web-interface. See who is in the office and know who is on a call or away. Have calls only ring during business hours or forward only when you change your status. Not just for call centers, the Switchvox brings powerful call sequencing and queuing to offer new ways to handle lots of inbound callers more efficiently. Great for training and auditing calls, managers can easily monitor, whisper, barge and record calls from the Switchboard web interface or from mobile phone app. Forward your voicemail messages to your email with an audio attachment. Or, add our voicemail transcription service and read your voicemail as typed text. Get the free mobile app downloads and 30 days to find out if Switchvox is right for your business. For a limited time, experience the full power of our award-winning Switchvox Cloud-hosted phone system risk-free for 30 days! You’ll get five Switchvox Mobile app users, five Switchboard web dashboard users, inbound and outbound calling, unlimited call queues, call recording, and every other feature above. We won’t disturb anything with the phones you have now. We just know we’re the best cloud hosted business phone system and seeing is believing, so we put our money where our mouth is! What have you got to lose? When you avoid the cost of desk phones, you’re free to put those resources to more productive things. Mobility equals freedom. Switchvox Small Business Mobility Edition ensures customer calls are always professionally answered and get effectively routed to a real human being, even if your organisation is distributed, virtual and mobile. Switchvox Mobility delivers powerful main line features with an auto-attendant, receptionist option, dynamic member call groups and configurable voice menus. Switchvox Mobility ensures you can always reach colleagues and transfer calls to them with a few clicks. 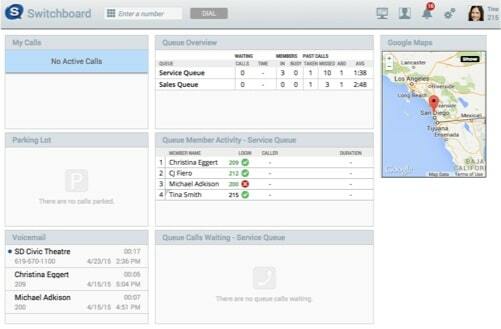 It includes a live online directory where you can instantly see if a colleague is in a call or in Do Not Disturb mode. You can click to call, or dial and transfer main line calls using short number extensions. Your company voice mails are always accessible on the go. With Switchvox Mobility you no longer have to share or reveal your personal cell number to business contacts. Give your personal cell number only to friends and family, such that you ensure only they can get through to you when you are not available for business calls. Set your office line to ‘Do Not Disturb’, or leave call groups, to avoid receiving incoming office calls to your smartphone when you are not working. Switchvox Small Business Mobility Edition allows you to manage your company calls professionally anywhere there is a Wi-Fi or cellular network, in the office, home, hotel, meetings, car, abroad, and in a coffee shop. All carriers and cellular network standards are supported. Switchvox Mobility brings mobile telephony back into the management domain of the business. With Switchvox you can easily check the history and status of all your company’s business calls. More than 1/2 of business calls today are cellular, bypassing your existing landlines, virtual PBXs, PC soft-phones, hosted VoIP or fixed phone lines. With Switchvox, IT managers regain their ability to manage corporate communications and to double-check important customer calls are dealt with in a professional manner. Yes, but once you download the app on your smartphone there really isn’t much else to do. We can help you setup your app over a simple phone call. If you would like an on-site technician to assist you in person, we have a thousands of qualified installers available throughout the United States to install it all — headache free. It’s entirely your choice — whatever option fits you best. Why choose a phone system with its own softphone app? The Switchvox phone service supports any standard SIP phone and softphone app including Cisco, Polycom, Yealink, CounterPath, and more. But our Switchvox Softphone smartphone app is unique (and best) because it fully integrates with the Switchvox phone system service and all its features. Yes, we do offer a 30 day free trial of our Switchvox cloud phone service to test! Complete this simple form and we’ll set up your own demo server, configured however you like. Then, we’ll help you get the Softphone smartphone app downloaded and activated for up to five users in your office. Absolutely, yes! First, you have the ability to receive all incoming faxes in your e-mail as a PDF. Second, you have the ability to send e-mails from your desktop PC with a few simple clicks. Be sure to ask for the e-fax extension option when you order your new service. When a call is transferred from Switchvox to your Softphone smartphone app, you can Hold, Transfer, Record, or Conference. If you setup forwarding to your home phone or cell phone (instead of using the Softphone smartphone app), you have “hidden” options that emulate features you would normally have when using the smartphone app. Those include the ability to place the call on music-on-hold, transfer the call to any other user, send the caller to your voicemail (or someone else’s voicemail), or enable immediate call recording using a simple ** code. Yes! Voicemail can be accessed through the screen of the Switchvox smartphone app, allowing you to scroll up and down through the list of all voicemail messages (and call recordings) showing the time, date, and Caller ID of each message allowing you to quickly choose which messages to play and which to delete or forward. Voicemail messages can also be set up to forward to your e-mail address with the audio attached. Included with your monthly subscription is unlimited 24/7 technical support. Call, e-mail, or submit a trouble ticket to technical support easily if any issue should ever resolve. We’re here to help!